AURIN continues to work with data partners in unlocking data that enables Australia’s researchers to conduct their research efficiently and effectively. 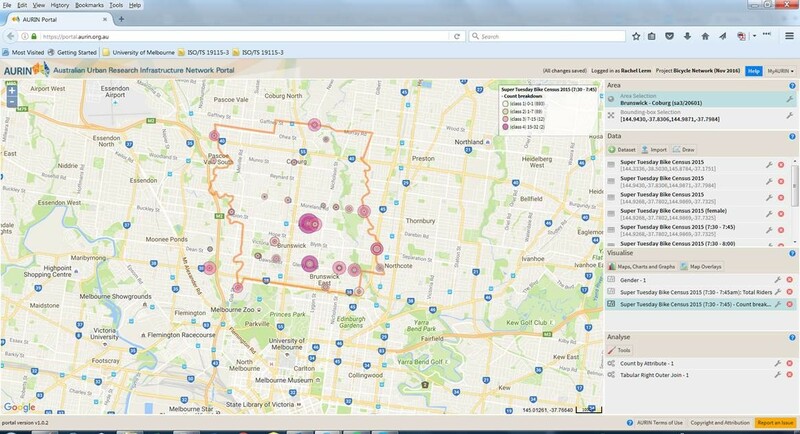 We are happy to announce that, in partnership with Bicycle Network and the Australian National Data Service (ANDS), AURIN users now have access to the Super Tuesday 2015 Data via the AURIN Portal. Run by Bicycle Network, Super Tuesday is Australia’s largest visual bike count, where volunteer counters observe and record cyclist numbers across Australia. This data is collected within 97 councils and over 1,500 sites. This makes the Super Bike Counts, Australia’s largest cycling survey of its kind. Log on to the AURIN Portal and choose your area of interest. Filter by intersection or time of day, map peak times or explore gender biases. This data can be interrogated alongside the thousands of other datasets already available through the AURIN Portal across all research disciplines, helping the researcher, planner or policy maker make good decisions based on sound evidence. Bicycle Network’s goals of being committed, honest, inclusive and progressive have led to the release of this data. Leading the way in data sharing for the benefit of all Australians. AURIN’s work in curating the metadata and funding provided by ANDS makes this enormous dataset easily read and interpreted. Like what you see and want more? Data collected prior to 2015 is available by contacting Bicycle Network. This entry was posted in Announcements, Cycling, Data, Government, Metadata, Resources for Research, Sustainability, Transport, Urban Development and tagged Cycling, Data, Evidence Based Decision Making, Metadata, Policy, Policy Making, Research, Sustainable Transport, Transport.